The two major reasons for this expected climb in international prices are production decline from Venezuela and the fact that we are nearing November 4, when the US sanctions against Iran are set to be implemented. Once that happens, the woes of the government are likely to worsen. The Central government is stuck between the devil and the deep blue sea as far as the runaway fuel prices are concerned. Shine Jacob explains the possible options before it and what a cut in the taxes means for the states. What is the stand of the government at the Centre on the runaway oil prices? The Union finance ministry is of the view that any cut in excise duty will shrink the developmental expenditure of the government for the financial year, which the government may not like to do in an election year. For every rupee per litre cut in excise duty on petrol and diesel, the Centre will have to forego around Rs 14,000 crore in revenue. At present, a fixed Rs 19.48 per litre on petrol and Rs 15.33 per litre on diesel are levied as excise duty by the Centre. The other choice before the government is to bring back the controlled pricing mechanism or to push states to include petrol and diesel under the Goods and Services Tax (GST). The Centre has also asked state governments to cut state taxes in order to bring the prices down. What is the stand of the states? During the financial year 2017-18, all the states put together collected around Rs 1.84 trillion in the form of sales tax/value added tax. Fuel taxes contribute a major chunk of state revenues, especially for states like Maharashtra, Tamil Nadu, Uttar Pradesh, Karnataka and Gujarat. Three state governments have so far cut taxes on petrol and diesel - Rs 2.5 per litre by Rajasthan, Rs 2 by Andhra Pradesh and Rs 1 by West Bengal. However, states are unlikely to go for further cuts and may not agree to include it under GST as it may wipe out a large chunk of their revenues. At what point should the central government intervene? The Budget had pegged crude oil prices at $65 a barrel for the current financial year and had taken an average of Rs 65 a dollar for the rupee. Based on this estimate, the crude oil import bill was expected to be $105 billion in 2018-19, 20 per cent higher than that in 2017-18. As per government estimates, a $1 increase in crude oil prices requires an increase of 63 paise in the prices of both petrol and diesel. Similarly, every one rupee depreciation against the dollar requires a 50 paise increase in the prices of both. 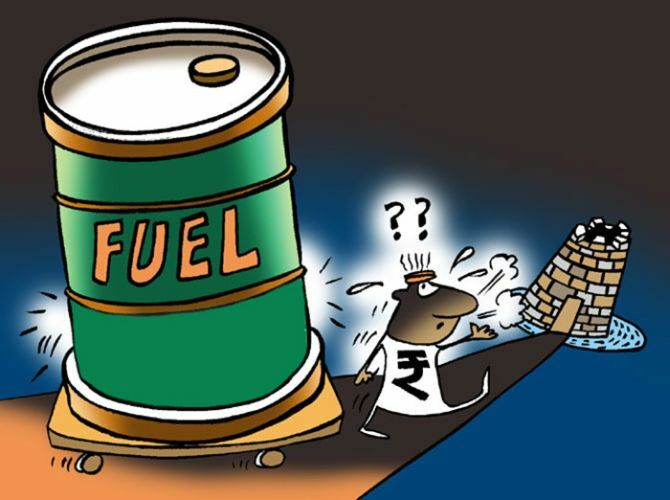 On September 13, Indian basket crude oil prices touched $78.06 a barrel and with the rupee hovering around Rs 72 versus the dollar, the pressure on the government to act has increased. Why is the government resisting tax cuts? Why do some experts consider higher taxes good economics? Many believe that though bad politics, higher taxation is good economics as it may contain inflation and help keep the fiscal situation under control. Interestingly, even at a higher taxation regime, consumption is increasing. Petrol consumption has seen a growth of 8.2 per cent from April to July this year, while that of diesel rose 3.8 per cent during the period under review. To what extent are international crude oil prices to blame? On Wednesday, Brent crude prices were seen at $79.13 a barrel at one point. April onwards, Brent was within the price range $70-$80 a barrel. According to International Energy Agency, this level could be tested in the coming months because of various geo-political factors. What impact will the relentless rise in oil prices have on the Indian economy? For the first quarter of the financial year 2018-19, the current account deficit has gone up to $15.8 billion compared to $15 billion during the same time last year. Based on one estimate, with every $10 per barrel rise in crude prices, GDP growth will drop by 0.2-0.3 percentage points, while the current account deficit will increase by 0.4 percentage points of the GDP and WPI inflation will climb by 1.7 percentage points. CPI, on its part, depends on retail prices as petrol, diesel and cooking gas have a weight of 2.4 per cent and transport, based on such fuel, at 1.9 per cent.